Radio has been the foundation of distress and safety systems used by ships for the safety of human life at sea in 1899. It was soon realized that to be effective a radio based distress and safety system had to be founded on internationally agreed rules concerning the type of equipment, the radio frequencies and the Morse Telegraphy. The first international agreements were established in the beginning of the 19th century and are still valid. Since its establishment in 1948, IMO, tried to improve the telecommunication requirements, in order to promote safety at sea. SOLAS International Conventions of 1960 and 1974 required the installation of radio-telegraphers in all passenger and cargo vessels of more than 1600 gross tonnage, and radio-telephonic installation for cargo vessels from 300 to 1600 gross tonnage. With these devices the transmitted danger calls of the vessels were covering a distance of 150 nautical miles. Thereby, vessels sailing in a larger distance were not able to activate a coast station and the danger call was depended on luck and was addressed to a ship-to-ship direction. 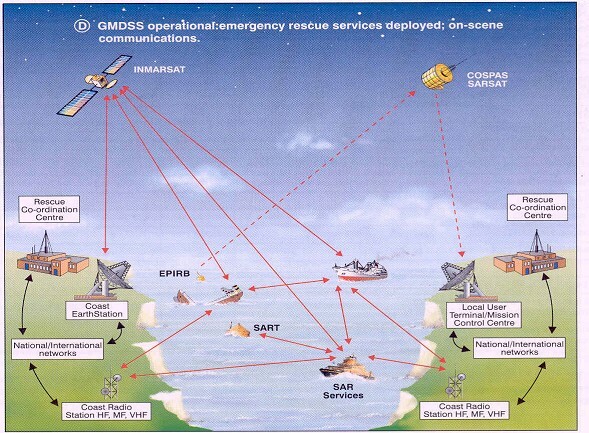 The development of technology and satellite communications led, in 1979, to the application of a new global plan for maritime search and rescue in both coastal and open sea areas with the cooperation of neighbor countries. The next step, after the recognition that the application of a new global system could help the improvement of danger and safety communications, was the modification of the 1974 SOLAS requirements concerning the vessels’ radio installations. In 1988 the necessary modifications took place. Moreover, the initiation of the gradual application of the new danger and safety global system (G.M.D.S.S) in 1-2-1992 and its full application in 1-2-1999 was decided. The main mission of G.M.D.S.S is the immediate activation of the terrestrial search and rescue services as well as the notification of the vessels that are in direct adjacency with the vessel in peril, so that the coordination of the efforts of search and rescue and the provision of help to the vessel in peril to take place in the less time possible. The system also provides the mariner with urgency and safety communications, as well as with notices concerning navigation safety, weather forecasts etc. G.M.D.S.S enables vessels, regardless of the area they are sailing, to accomplish all the necessary communications of vital importance for their own safety and for the safety of other vessels that are sail in the same area.